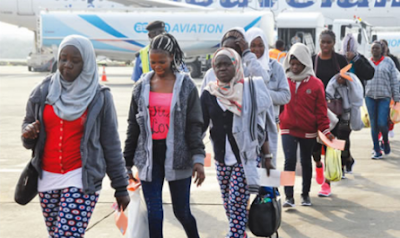 The National Emergency Management Agency (NEMA) yesterday received 167 stranded Nigerians from Libya, bringing the number of Nigerians brought back to the country in the last four days to 532. The News Agency of Nigeria (NAN) reports that Boeing 737-800 aircraft, marked 5A-DMH, arrived at the Murtala Muhammed International Airport, Lagos at 7:47p.m. The returnees were brought back by the International Organisation for Migration (IOM) and the European Union (EU). They comprised of 21 women, 145 men and a child. NEMA’s Director-General Mustapha Maihajja, who received the returnees confirmed that three of them had medical cases and were promptly given treatment by doctors and paramedics. Maihajja, who was represented by the Southwest Zonal Coordinator of NEMA, Suleiman Yakubu, said two of the returnees were now in stable condition, while the third person had been referred to hospital for further treatment. He advised the returnees to acquire vocational skills or further their education to contribute their quota to national development. Also on hand to receive the returnees were officials of Nigerian Immigration Service (NIS), National Agency for the Prohibition of Trafficking in Persons (NAPTIP), the Federal Airports Authority of Nigeria (FAAN) and the Police.